Let me preface this by saying that I was so ready to make a rainbow cake, but then I decided that it seemed like a lot of work and also, we don’t have a cake form. The idea behind this is super easy, but it took me a lot longer than I thought it would. So if you can get one person to help, it’ll go so much faster. 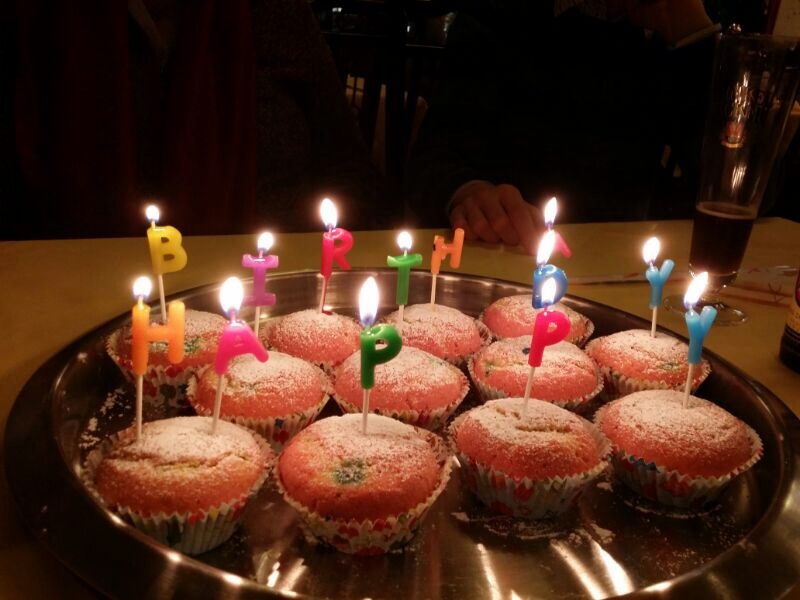 For Michael’s birthday I wanted to bake something special. I wanted it to be pretty, so I did some googling and found a recipe for a rainbow cake, which lead to a recipe for rainbow cupcakes. I didn’t end up making the cream topping because we went to a restaurant and I didn’t think the cream would still be good by the end of dinner, so I just dusted the cupcakes with icing sugar. 1. Mix the softened butter with the sugar and vanilla sugar until it’s creamy. 2. Mix the eggs into the mixture. 3. Mix the flour, baking powder and salt in a separate bowl. 4. Alternate mixing the flour mixture and the milk into the mixture. 5. Once the dough is smooth, separate it evenly into 6 small bowls. 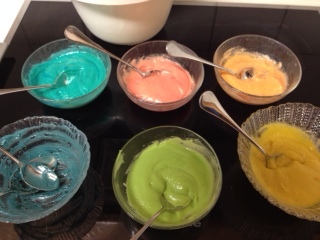 These bowls of mixture then need to be coloured according to the rainbow. 6. 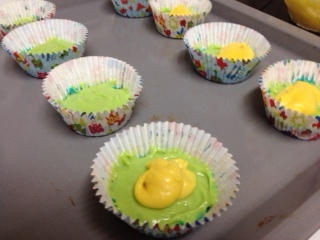 Using a teaspoon, put one teaspoon of each colour into the cupcake forms. Start with purple, then add blue, green, yellow, orange and then red. Flatten each layer as you go, not forgetting to get the colour all the way to the edges. Once you start to put on the red layer, preheat the oven to 180°C. 7. 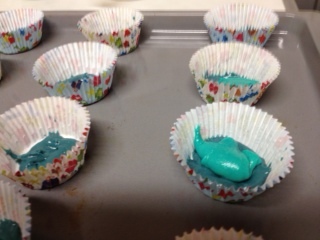 Put the cupcakes in the oven for 12-15 minutes (fan-forced). 8. Test if the cupcakes are ready by doing a poke test with a skewer. If the skewer comes out clean, the cupcakes are ready. Let them cool completely on a cooling rack. 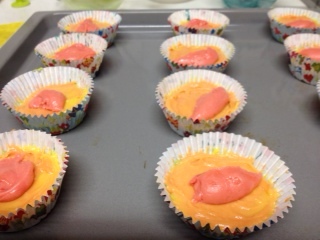 Cream – Beat the cream until it becomes firm, and then use a piping bag to decorate the cupcakes. The optional sprinkles can now also be added. 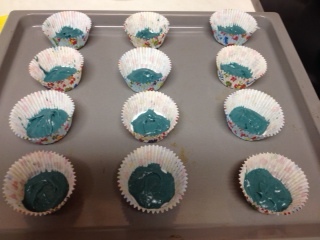 Icing Sugar – using a sieve, sprinkle icing sugar evenly on the cupcakes. And voila! 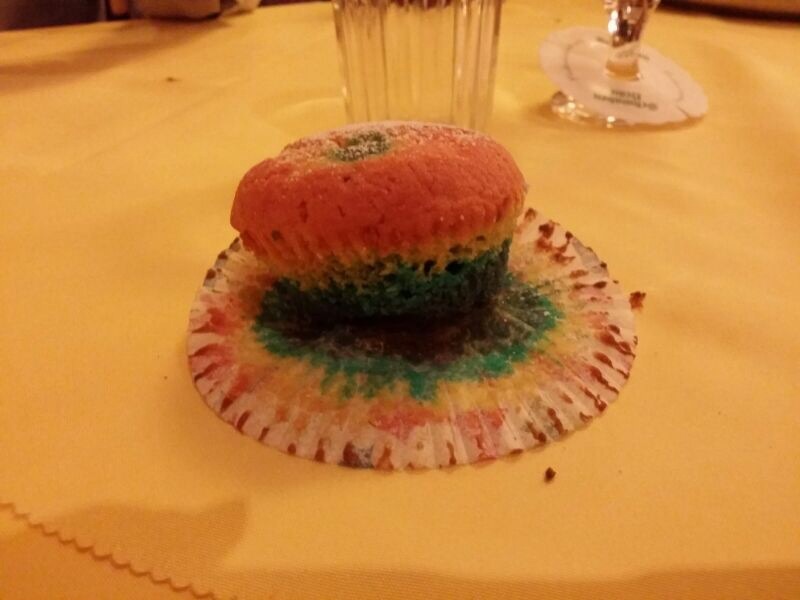 A rainbow cupcake.